Here’s a fantastic new cocktail based on traditional tiki drink ingredients: demerara rum, lime juice, cinnamon and honey. This recipe is in the January/February issue of Imbibe magazine, and was developed by Martin Cate of Smuggler’s Cove in San Francisco. Fill a shaker full of ice. 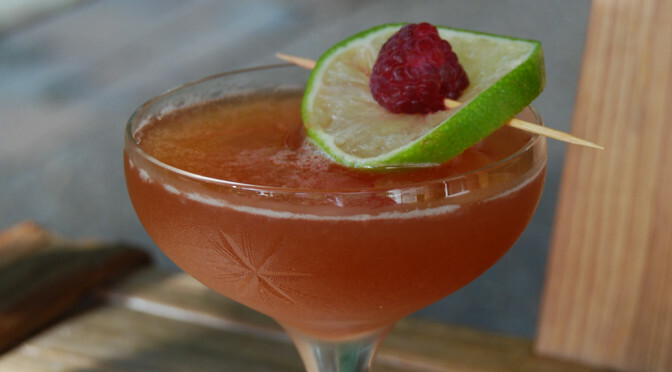 Add the rum, raspberry liqueur, lime juice, syrups and cinnamon. Cap the shaker and shake vigorously for 15-20 seconds. Double strain into a chilled coupe glass. 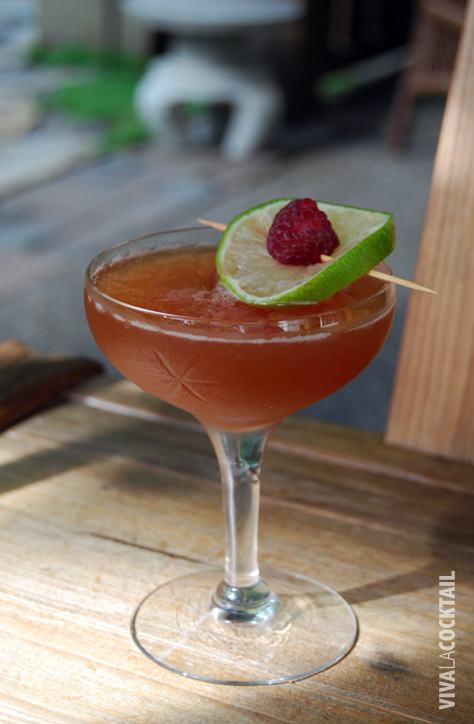 Garnish with a raspberry lime wheel. I am a huge fan of demerara rums. They are aromatic and pungent like Jamaican rums, but are also drier and smokier giving them a very distinctive flavor. The aged demerara rums (like El Dorado 12, 15, 21 and 25 year) are lovely on their own as sipping rums, but the younger ones really shine in tiki drinks like a Demerara Dry Float, Queen’s Park Swizzle and the Center of the Galaxy. Demerara rum also comes in 151 proof for higher-octane cocktails such as the 151 Swizzle, which is also a favorite of the house. The easiest way to make drinks sweet is to add sugar syrup. Syrups are easy to make and keep well in the fridge for a couple of weeks in a tight fitting container. You can also make flavored syrups to give your cocktail an extra dimension. If you’re wondering what simple syrup is then you’ve come to the right place. Simple syrup is a common ingredient for certain cocktails that require a little sweetness. The best simple syrup is to make your own—if you buy it you’re likely to get a bunch of preservatives and other things in it you don’t need. And, it’s cheaper to make your own anyway. Here are a few ways to make simple syrup. Place sugar and water in a small saucepan and stir until dissolved. Bring to a gentle boil over medium-high heat. Reduce heat and simmer until syrup is slightly thickened, about 3 minutes. Remove from heat and let cool. Transfer syrup to a container with a tight-fitting lid, cover, refrigerate and use as needed. Combine sugar and water in a bottle with a tight fitting lid, and shake it until dissolved. It will be cloudy for a bit, but will eventually clear up. Cover and store in the fridge until needed. This method comes in handy if you run out in the middle of making drinks, or if you’re kinda lazy like me. Whatever method you choose, you can also substitute Splenda Granulated Sweetner for sugar if you want a sugar free alternative. I use this when I make a drink for my Dad who is diabetic. You can also make flavored syrups, but I will update this post when I include recipes that call for those. Demerara syrup is called for in some tropical drinks. You just follow the recipe for Rich Simple Syrup, but use demerara sugar instead of granulated sugar. Demerara is a natural brown sugar found at many specialty food stores. If you’ve ever tried to make cocktails using honey, you’ll quickly find that it’s difficult to work with in the shaker. It’s messy and often freezes after you’ve given the tin a few good shakes. I prefer to use honey syrup. You get the flavor of the honey but is easier to use and mixes up better. Place honey and water in a small saucepan and stir until dissolved. Bring to a gentle boil over medium-high heat. Reduce heat and simmer until syrup is slightly thickened, about 3 minutes. Remove from heat and let cool. Transfer syrup to a container with a tight-fitting lid, cover, refrigerate and use as needed. Are you seeing the syrup pattern yet? Yep, just sugar and water boiled together. You can add other ingredients to give your syrup a special flavor. Here’s a good and quick recipe for ginger syrup. Place sugar and water in a small saucepan and stir until dissolved. Add ginger and bring to a gentle boil over medium-high heat. Reduce heat and simmer until syrup is slightly thickened, about 3 minutes. Remove from heat and let cool. Transfer syrup to a container with a tight-fitting lid, cover, refrigerate and use as needed. 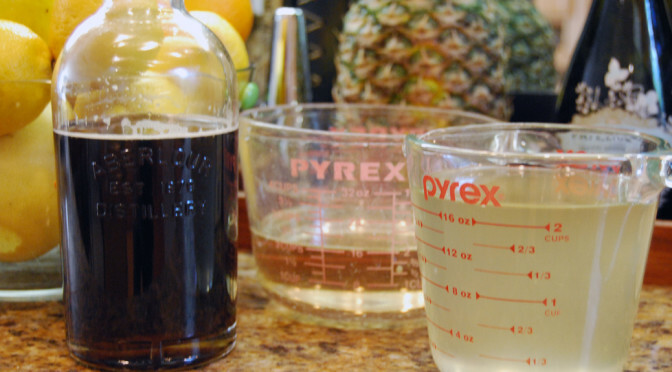 One thing to keep in mind about ginger syrup—it loses its flavor fairly quickly. Make it in small batches and keep for up to one week.